Coming soon from the roper center! The Roper Center recently announced it will begin to use an online analysis system called SDA (also used by IPUMS and ICPSR). This system allows users to conduct secondary analysis on about 1,500 surveys without having SPSS, SAS, or STATA. The system will be launched soon. Check The Roper Center for more information. The future is an amazing place! So much data, so little time... Next week on December 21 we will have our first peek at Census 2010 data. While you won't be able to access the data through American FactFinder until February 2011, on December 21 the Census Bureau will release the state population totals for House of Rep apportionment. Did NC lose? Will Utah win? Be the first to know! You can also view apportionment data through the past century using the widget below. Census 2010 data will be added on December 21. OMG! Can't wait! It's like Christmas! 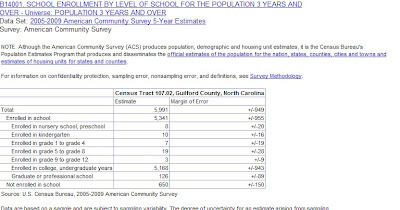 The American Community Survey 5-Year Estimates are now available from American FactFinder. For the first time, you can discover ACS data at the tract and census block level. Amazing! The 2005-2009 ACS 5-year estimates include estimates on most (but not all) topics included in the survey. Several topics that were added or modified in 2008 and 2009 are not included in these 5-year estimates. These include Bachelor's field of degree, disability, marital history, health insurance coverage, and service-connected disability status and ratings. The first 5-year estimates for these topics will be available in the 2013 release of the 2008-2012 5-year estimates (except for Bachelor's field of degree, which will be available in the 2014 release of the 2009-2013 estimates). For a complete list of topics covered on the ACS questionnaire, browse Subjects included in the American Community Survey. 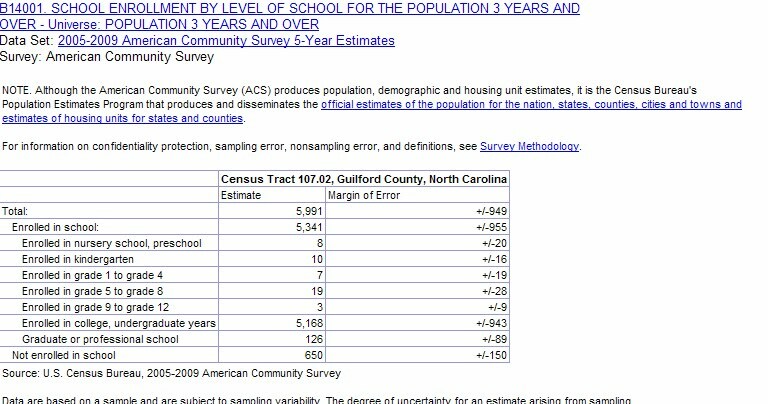 For the advanced dataland geeks, you can even compare tables between the 2005-2009 ACS 5-year estimates and Census 2000 SF3! Geek-a-rama! New ACS data coming to a tract near you! At 9am on December 14th, the Census Bureau will release its American Community Survey 5-Year Estimates. You will be able to use ACS data for geographies with fewer than 20,000 people (like tracts, block groups, and blocks). More info on the American Community Survey website. We here in dataland can't wait and will have champagne corks at the ready! See you next week on American FactFinder!